It’s the project that has captured imaginations across the region, and now new parents, proud grandparents and art lovers alike can recreate their own ‘Born into a City of Culture’ artwork at home. Hull University Teaching Hospitals NHS Trust has launched a series of six, limited edition postcards which will be produced over the course of this year. One postcard will be produced every two months, featuring scaled down versions of midwives’ handprints and baby footprints taken in the preceding two months. Once complete, the six postcards will together form an exact replica of the artwork, depicting trees throughout the seasons, which is currently taking shape in the Women and Children’s Hospital. “We’ve had a really positive response to this project, and we often see parents and visitors stopping to look at or discuss the artwork which is already there. It seems to be something which has really captured imaginations and people seem genuinely proud to be involved. Postcard 1, featuring baby footprints taken in January and February, goes on sale tomorrow (Thursday 20 April) between 10am and 2pm, priced at just £1. Postcards can henceforth be bought for £1 each from within the main foyer at the Women and Children’s Hospital, Monday to Friday, 10am to 2pm. Proceeds will be reinvested within the ‘Born into a City of Culture’ project. 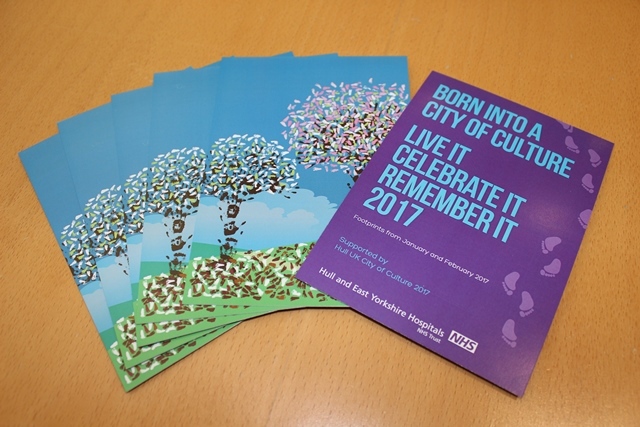 The ‘Born into a City of Culture’ project has been supported with a Hull City of Culture Creative Communities grant. The sixth and final postcard will be available in January 2018, after all of the footprints have been collected from December babies.